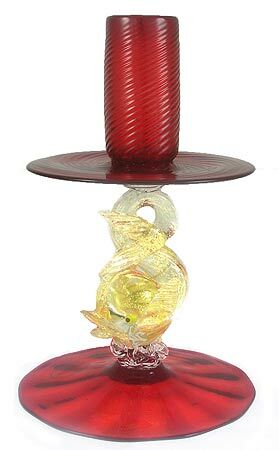 A reproduction of classic Murano glass candlestick holder from the 18th century. A brilliant red glass accented with a dolphin stem adorned in 24kt gold foil. Makes for a beautiful formal table setting or as accent pieces over a fireplace. Also available in clear glass with a gold foil dolphin, or in red with a simple ball stem. Also available in Crystal/Gold.